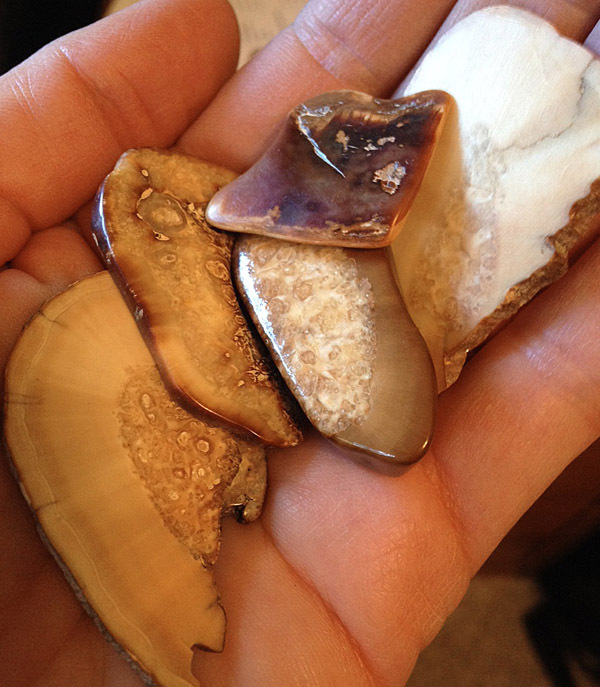 Occasionally we hear from people who are concerned about the use of fossilized ivory in our jewelry designs. With so much justified outrage over the abominable new ivory trade, we felt it was time to clarify the materials used in our beloved jewelry designs and our continued commitment to wildlife conservation. We exclusively use fossilized walrus ivory (between 300 and 5,000 years old) and ancient mammoth ivory (over 10,000 years old) in Zealandia jewelry. No living animal is harmed in the sourcing of this ancient ivory, and we are passionately against the new ivory trade that continues the senseless slaughter of our precious animal populations. What is Fossilized Walrus Ivory? Many of our jewelry designs are created with fossilized walrus ivory which is gathered on St. Lawrence Island in the Bering Sea off the north west coast of Alaska. The fossilized walrus ivory is between 300 and 5,000 years old, and it comes from the tusks of animals that died long ago. Bits of their tusks find their way into the earth and lie buried for centuries, accreting a variety of cream to caramel and cocoa hues from nearby minerals. Zealandia’s founder and lead designer, Jenny Byrne, fell in love with this rich material several decades ago. Its unparalleled quality and sense of history inspired the Zealandia jewelry line that today is beloved the world over for our craftsmanship and totemic themes. Fossilized walrus ivory in varying shades. The native Yupik Eskimo people on St. Lawrence Island rely on the fossilized walrus ivory trade as a vital part of their economy. Zealandia owners Jenny and Chuck visited the island a few years ago on a buying trip to source the finest fossilized walrus ivory from the gracious Yupik. 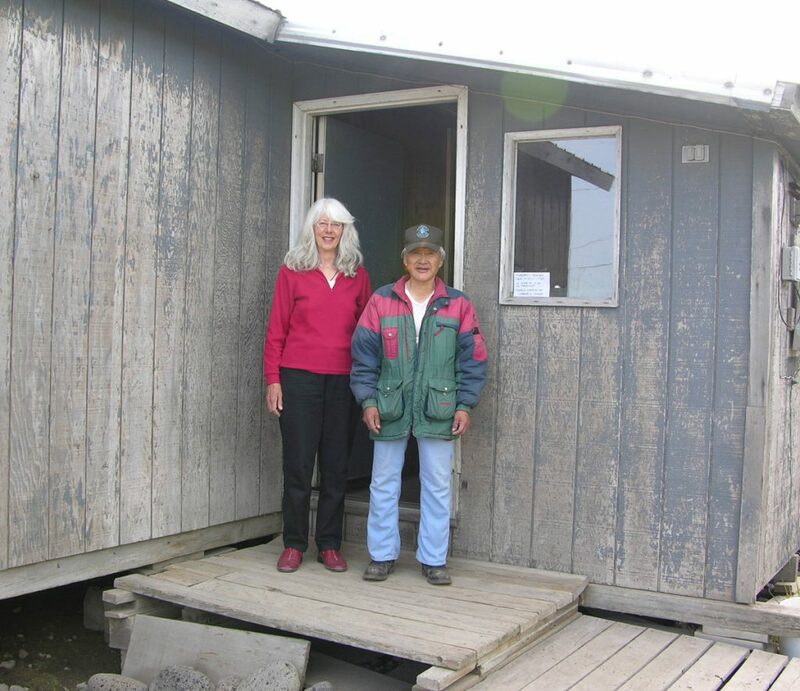 As there were no hotels in St. Lawrence's Savoonga village, they had to find a local Yupik willing to rent a room in his house. Their kind host allowed them to set up shop in his mud room. Once word went out that Zealandia was buying and paying a very fair price, there was a line outside the door. Because of Alaska's 24 hours of summer daylight the Yupik sellers were still waiting outside at 2:00 in the morning. At last Jenny hung a closed for business sign on the door to steal a few hours of sleep. Jenny and Chuck paid a premium price to the sellers and enjoyed an excellent relationship with them. 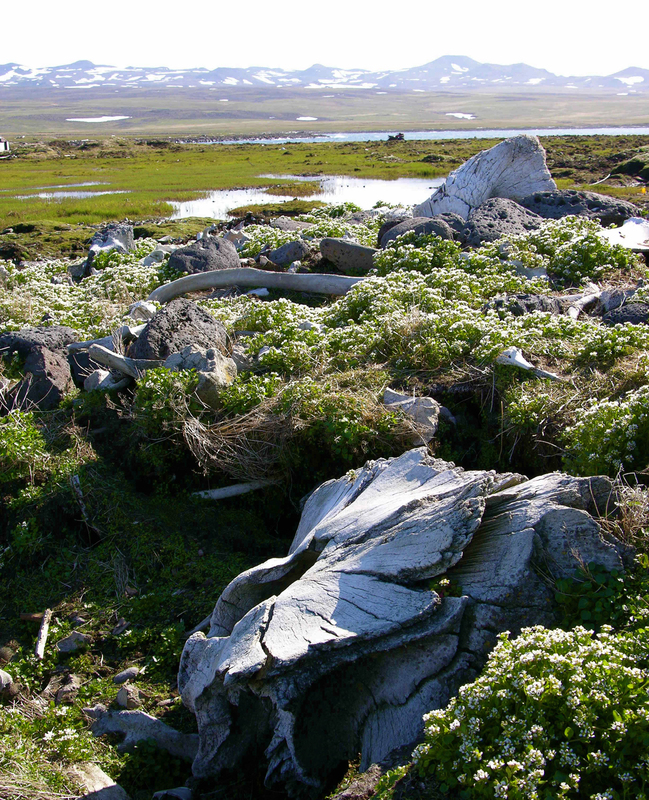 The fossilized walrus ivory is gathered on St. Lawrence Island at specific dig sites, on the island’s beaches where it is washed up, and on a nearby smaller island that is only accessible to the natives. Any visitor to St. Lawrence is strictly prohibited from taking so much as a stone away with them without permission or as part of a sale/trade agreement. This land is protected for the Yupik’s exclusive use, and it is their home. The island is closer to Siberia than to Alaska. It is believed to be perhaps the largest above-water example of the ancient land bridge that once joined Asia and North America many millennia ago. 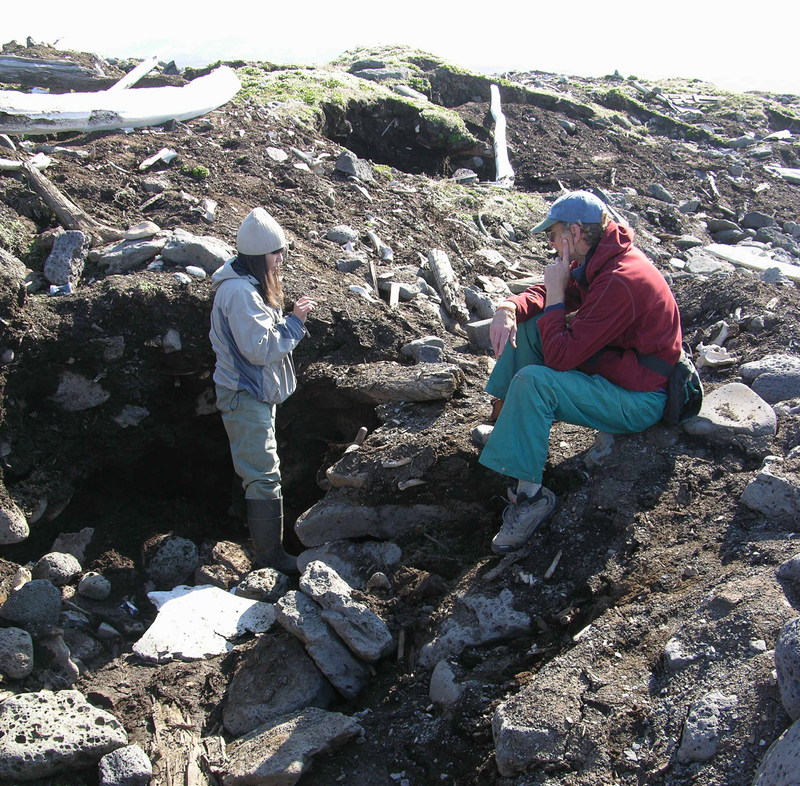 A Yupik woman takes Chuck out the dig site for a first-hand look at their work. Fossilizing marine animal bones in the foreground and mountains in the distance on treeless St. Lawrence Island. 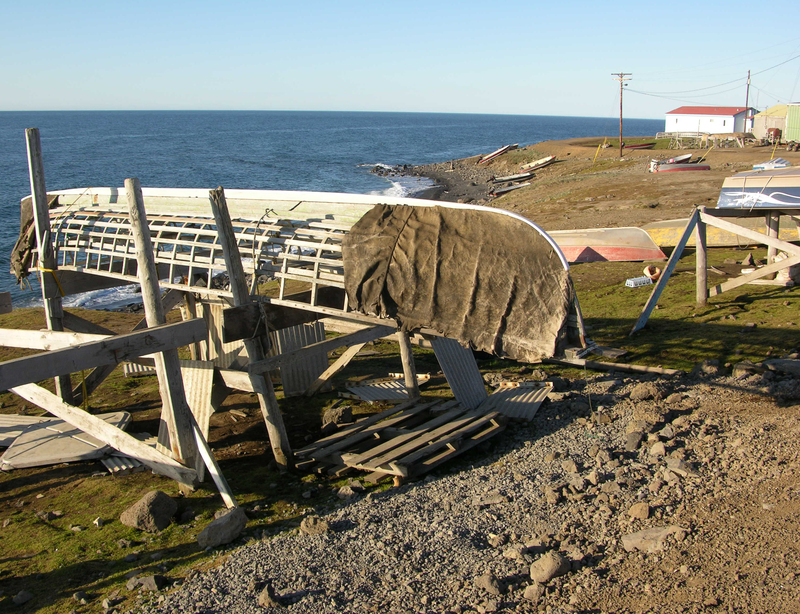 A more traditional Yupik fishing boat pictured near a modern aluminum-sided version. 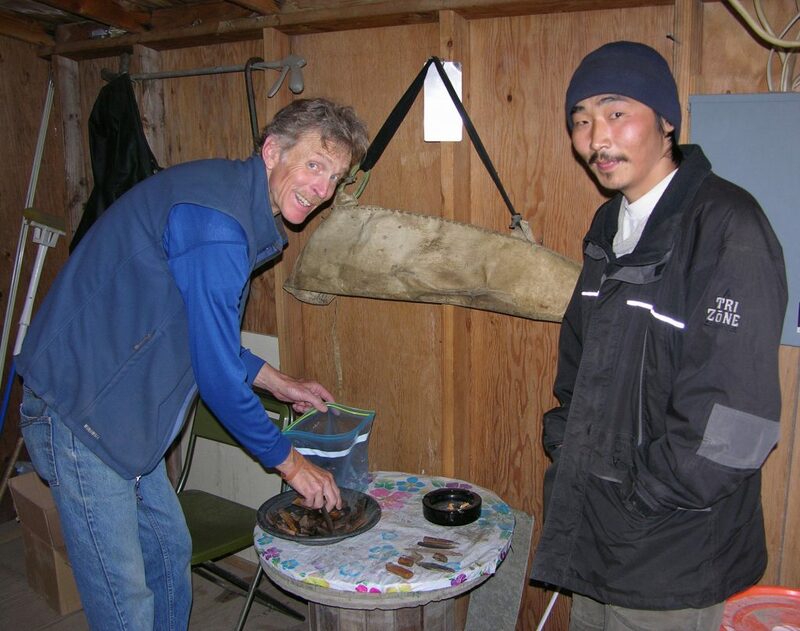 Walrus and fish are still a staple of the Yupik diet, although sugar and processed foods are now a ubiquitous favorite. Select Zealandia jewelry styles are made with ancient mammoth ivory that dates back over 10,000 years to when the last of the mammoths roamed the earth. Mammoth ivory is typically whiter than the more earthy fossilized walrus ivory. For this reason, mammoth ivory works well in certain designs that look best with a higher contrast pale ancient ivory against the sterling silver settings we use. A big part of Jenny’s mission at Zealandia is to give back to the wildlife conservation causes that help combat the new ivory trade and preserve the world’s species for generations to come. For more on Zealandia’s philanthropic commitments, please visit our Giving Back page. We feel that the use of ancient fossilized ivories helps to combat the new ivory trade by providing a gorgeous alternative to new ivory that in no way harms any living animal. This, and the fact that fossilized ivory is a vital part of native economies, ensures that we are doing our part to offer a beautiful and ethical product that can be enjoyed by everyone for years to come.